There’s nothing like a good steak knife in your hands when you’re enjoying a fine steak dinner with family or friends. In some cases, it’s about functionality. Other times, it’s about having the finest wares available to have that dinner with the ones you love, or perhaps someone you want to impress. No matter the reason, one thing is true. We’re all looking for the best steak knives in our particular budget. At the crossroads between our silverware and a kitchen knife set, steak knives are both a necessity and a staple of the dining room. They are a tool, but also a show piece at times. Fortunately, and unfortunately, there are so many options when it comes to good steak knives. It’s great that we as the consumers have so many options, but it makes it difficult to find the right steak knife set for us. You can find steak knives that range from $1 per knife to over $50 per knife. There you have it, our favorite steak knife set in each price category. Clearly not all of us have the same budget, or perhaps even the same outlook on how much should be invested in buying good steak knives. This is the reason the BladeAdvisor team has decided to split this page up into different sections. First, we’ll review and recommend the best steak knife set and 2 runner-ups in each of the three price categories: high-end, mid-range, and inexpensive. We will not only make the recommendations, but share some of the features of each set and then tell you why we like that set in particular. After the steak knives review, we’ve written a very comprehensive buying guide to help educate you in how to find the best steak knife set for you and your needs. We cover just about everything there is to know about how to choose a good steak knife. But first, let’s define the different price-points and budget categories we’re going to break the steak knife reviews into. This set by Wüsthof is the best of the best when it comes to quality steak knives. Wüsthof has been around making high- quality knives in Germany for over 200 years. This set of classics is forged with high-carbon stainless-steel blades and hand-honed for edges that are razor sharp. You simply cannot go wrong with a set of Wüsthof Classics. Don’t be fooled by the lower cost Gourmet Series steak knives. They are not made with the quality of materials or the craftsmanship that the Classic Series is. Wüsthof steak knives are a perfect wedding gift. The quality and style is timeless! This is the best steak knife set money can buy. The Dalstrong Shogun Series are Japanese-inspired steak knives where performance matches a beautiful design. Dalstrong uses 66 layers of only premium high-carbon stainless steel to ensure durability and strength. These Shogun steak knives are perfectly balanced, ultra-sharp, and very strong. These Dalstrong Japanese steak knives are super hard, ultra-sharp, and great looking. We really like their “tsunami-rose” genuine Damascus layers, very similar to some Shun steak knives. Another of our favorite things about this steak knife set is the way Dalstrong stands behind them. A customer who buys this set is provided with a 120-day money back guarantee and a lifetime warranty against defects. These were very close to being our top rated steak knives, and would make another great heirloom gift. The Global GSF-4023 steak knives are definitely some of the best money can buy. Global uses Cromova 18, a trade secret stainless steel combination that ensures a hardness that retains sharpness over many uses. Most Western and Asian-inspired knives use a beveled edge, however these Global steak knives use a very sharp straight edge, an edge that is much larger than most. This set of Global steak knives is different in appearance than most other steak knives, making them unique in that regard. That being said, they are made using the utmost quality standards and premium materials like all of the good steak knives we’ve discussed thus far. Thank you for checking out our recommendations on the best high-end steak knives. If not, the list of the best mid-range steak knives review is shown next, just keep reading. Still just not sure what you’re looking for? Check out our steak knife buying guide for more guidance and what to look for and how to choose. The Dalstrong Gladiator Series steak knives have a full-tang, are made of high-carbon German steel, and are incredibly sharp. They are an award-winning design that give you a luxury feel at a great price. Dalstrong is playing no second fiddle in our mid-range “best steak knife set” category. The Gladiator series is a great knife, and quite frankly, you’re getting a lot for your money with it. It’s a great price for such a quality knife. They would be a great addition to your kitchen or as a very nice gift for a loved-one. We think these are the best steak knives under $100. This 6-piece steak knife set is made of German stainless steel and is of superior-quality. Like other higher-end knives, these from Foxel include a full-tang design and are triple riveted for durability. This steak knife set comes in 6 pieces and is still in the same price range as several 4-piece sets of similar quality. Now that’s great value! It’s also somewhat unique to find top rated steak knives in sets of 6, so this is a great set if that’s how many you need. Our only concern with this great set is the warranty. Where other brands have backed up their product with a lifetime warranty, Foxel is offering a 1 year satisfaction guarantee or your money back. The Cangshan V2 Series steak knives include a beautiful solid acacia wood block and have a Rockwell hardness of 56+. It’s a very nice, large 8-piece set of quality steak knives. The BladeAdvisor really likes the look of this steak knife set. It’s a larger than normal set and includes a really nice acacia wood block to finish off the look. With the lifetime warranty, you can’t go wrong with the Cangshan V2 Series Japanese steak knives as one of the best mid-range sets available. Thank you for checking out our recommendations on the best mid-range steak knives. If not, the list of the best inexpensive steak knives review is shown next, just keep reading. 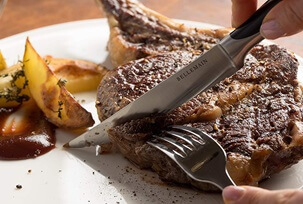 The Bellemain Premium steak knives are full-tang and ice-tempered for extra durability. The Bellemain Premium steak knife set appear to be of decent quality for so little $$$. They have great reviews online and have the buy back guarantee if you’re not entirely happy with your purchase. This is the best steak knife set for the price. Victorinox is the same company that makes the ever-popular Swiss Army knives! This steak knife set is dishwasher safe and carries a lifetime warranty. For a cheap steak knife, these Victorinox steak knives are very popular among consumers who have purchased them, carrying very high marks in online reviews. These Laguiole steak knives are made of high-grade stainless and are rust resistant. They have a sharp, pointed, serrated edge and also come in a gift box. The Laguiole steak knives are a very unique design that stand out from the rest. A nice, decently made set of cheap steak knives for anyone’s home. We followed the selection process outlined below in our buying guide. You can do the same thing and find the electric knife sharpener that best fits your specific needs. We almost all have a need for a steak knife set. They are a versatile tool that can used for several tasks around your kitchen. They are perfect for cutting steaks (obviously), tenderloin, roasts, pork chops, chicken, and many other meats. Steak knives seem like such a simple tool, yet there really is so much that goes into them. You’ll find after reading this guide, that they are not all created equal. In fact, the price range between the best steak knife set and a cheap set can vary drastically. Unless you’re educated on what makes a good, quality steak knife, it’s hard to know what you’re looking for. The BladeAdvisor team has put this buying guide together as an educational tool on how to select the best steak knives for yourself. It will also give you a better understanding what separates good steak knives from cheap ones, why you may or may not want a serrated blade, and what “full-tang” means. Once you’ve invested in a good set of steak knives, we’ll also help you care for them and store them properly so they last for years to come. Okay, so we recommended the best steak knife set in 3 different price categories, but what if they don’t fit your needs? Or perhaps you’re like us and you want to learn how to choose the best steak knives on your own. That’s great! We’re here to help. Below are the topics we think that you should consider when buying your steak knives. It also happens to be the criteria we used to populate the best steak knives lists above. There are many factors to consider. We’ll break them all down one by one in detail so we don’t miss anything. Some topics are more important than others, and this is especially true depending on which budget level you’re considering buying from. That being said, the first choice your probably need to make is about the amount of money you are comfortable investing in good steak knives. This is going to be different for everyone and we respect that no matter what level you choose. We are all at different stages in our lives and probably all come from different backgrounds and have different income levels and lifestyles. We don’t judge…promise. If you’re just looking to get through dinner without fighting with your steak and you don’t want to spend more than $25, we get it. The same is true if you’ve decided to invest in quality steak knives like the best of the best Wüsthof classics. Some people see the value in buying the best craftsmanship and premium materials upfront the first time so they last for life, and others either can’t afford it or just don’t care that much about steak knives. Either way, it’s okay. Then there’s those of us who fall smack dab in the middle. A quick guestimate says that’s probably most of us. We like nice things and don’t want to keep replacing junk. But at the same time, we don’t have hundreds of dollars to spend on knives we aren’t going to use all the time. We just can’t justify it. This is the reason, we ranked the the best steak knife sets in all 3 ranges. Once you’ve determined how much money you can afford to invest, it’s time to find the highest quality steak knives we can help you find for that amount of money. One of the more important choices you will have to make is the materials used. Steak knife blades and handles can be made from many different materials. There are two parts of the knife we should be concerned with, blades and handles. There are so many different steels out there that it can be confusing. Even more confusing, materials that are good for one reason have a trade-off for other reasons. For example, stainless steel is a great material for convenience-sake. It’s easy to wash, resists rusting and corrosion, and can often be thrown right in the dishwasher with the rest of your silverware. The trade-off to that is that blades made out of stainless don’t typically last as long as those made in a high-carbon steel because they are softer. Carbon is the hardest element and it makes for hard knife blades that hold an edge (aka – stay sharper) longer. For this reason, most fine dining restaurants prefer high-carbon steel blades. If you go this route, keep in mind that you will need to take special care when washing them (see below in “Caring for Steak Knives”). Each of the top manufacturers has their own preference for which alloys they use. Many are now marketing a high-carbon stainless steel. This basically means it has at least 10-12% Chromium (corrosion resistance) to make it “stainless” steel and roughly 0.5%, or more, carbon for hardness purposes. This is an attempt at getting “the best of both worlds”. Handles aren’t quite as confusing as blades, but there are still made of many different materials. The three most common include wood, steel, and some sort of poly or plastic. First let’s discuss wood handles. We hope not to upset anyone here, but wood is not our favorite material for handles. Yes, traditionally many steak knives in Western steakhouses use wooden handles and that’s part of the motif. Unfortunately, wooden handles run the risk of wood rot. In mild cases, they produce a funky odor. In more serious cases, the rot can ruin your handle and thus the knife. Wooden-handled knives require special care when washing and also storing them. This is a preference thing for us, but we did not recommend any knives with wooden handles above. So which is better then, steel or poly? They both have their benefits, but they are close enough in our eyes that again, it’s preference. Which do you like the look of? Both are long lasting, durable, and can be designed to look great. This choice is much easier than the previous. What’s the best steak knife set size? Well, that depends on your needs. How many knives do you need? They typically come in sets of 4, 6, 8, or 12 pieces. When choosing a set, consider when you’ll be using these steak knives and how many people you will be hosting. Make sure you get enough. There’s nothing worse than pulling out 4 “good” steak knives only to leave someone out with a “cheap” steak knife. If you know you need at least 6 knives, consider getting an 8-piece set. There’s not necessarily a lot to choose here. We just wanted to let you know that there is a difference in the balance and the weight of good steak knives versus cheap steak knives. There is even a difference in weight between German steak knives and Japanese steak knives! German knives are typically solid and much heavier than Japanese knives. They also have flatter angles, an average of roughly 20 degrees, which often makes the blades thicker, adding to their weight and durability. On the other hand, Japanese knives are usually lighter weight and have a thinner, sharper blade using a roughly 15 degree bevel. The age-old question, serrated vs straight edge steak knives. In case you’re not quite sure what we’re talking about, serrations are like small teeth on the blade, similar to a saw. A non-serrated knife has a straight edge. There are a couple schools of thought on this one. The theory is that serrated blades stay sharper longer. This is because less of the surface area of the blade makes contact with the hard, flat plate you’re cutting on, which is usually what dulls a steak knife. Since the areas between the serrations doesn’t touch the plate and only contacts the meat, it will not dull as quickly. That part of the blade continues to cut the meat cleanly. As with most things, there is a trade-off to this. Do steak knives need to be serrated? No, and for the same reasons these serrations may stay sharp longer, they are more difficult to sharpen. Although there are sharpeners, even electric knife sharpeners, that can sharpen serrated steak knives, they are typically just for touching up the edge and cannot be used to reshape or repair a damaged knife. Much of the info above is just the opposite for straight-edge (non-serrated) blades. Straight edge steak knives have one continuous edge, so much more of the sharp part of the blade makes contact with your plate. Because of this, it may dull more quickly, but these blades are much easier to sharpen, especially when the edge is damaged slightly. Straight-edge steak knives cut through meat very smooth and straight as opposed to ripping and tearing the meat with a serrated blade. There’s actually a 3rd option and that’s micro-serrated blades. These are usually found on a cheap steak knife set and they aren’t very durable. They are also very difficult to sharpen when compared to serrated and straight edge knives. They also tend to rip and tear meat rather than cutting it cleanly. We recommend staying away from micro-serrated knives unless you’re just buying a cheap set of steak knives and don’t care how long they last. If you’re looking to buy good, quality steak knives, steer clear of micro-serrated edges. Serrated vs Straight Edge Steak Knives: Which Are Better? Depending on who you ask, you could get either answer. Our opinion on this topic is that it’s personal preference. As you’ll notice, we have both listed in our list of the best steak knife sets above. The key is to care for your steak knives and store them correctly. If you do this, you’ll be keeping the blades nice and sharp and should not getting into a situation where the serrated steak knives need too much work. If you do, you’ll just have to send them off for repair or get them replaced. We really enjoy industrial design and appreciate the craftsmanship of good steak knives. There are many processes that take place to make quality knives that the average consumer doesn’t even know about. An example of this would be forged steak knives versus stamped steak knives. Forged knives are made out of a single steel bar and then shaped into a knife, either by hand or by a machine. Stamped knives are made of sheets of steel that are stamped out into the shape of a knife. Forging was once indicative of only high quality knives as they are often heavier and include a bolster. A bolster is a lip near where the blade meets the handle. It adds weight towards the center of the knife, thus improving balance and assisting the user with a better grip. This is not necessarily true these days as you can find some pretty good steak knives that are stamped and some not-so-good ones that are forged. If all else equal, forged knives tend to be harder and thus retain their blade edge longer. A tang is the is the extension of the metal blade through the handle. One that goes all the way to the end of the handle is considered a “full-tang”, whereas one that barely goes into the handle is considered a “partial-tang”. As you may have guessed, full-tang steak knives are superior to anything less. Full-tang steak knives are also typically more balanced due to the weight of the blade continuing through the handle, providing a better “feel” to the knife when you’re cutting. It is common knowledge now that this is true and most decent steak knives have taken this into consideration. There are so many decent steak knives, even for lower budgets and what consumers like to call “cheap steak knives”, that there’s no reason to settle for a full-tang design these days. We saved one of the best for last. Reading product reviews like the ones we how above on each of the best steak knives we selected is a great way to find good, quality products. This allows you to compare multiple good options of the same thing all at the same time and on the same page. Another awesome tool you should use are the many customer feedback ratings provided from actual product users at online retailers like Amazon. Most products that are not new to the market have hundreds or even thousands of customer reviews telling you if the product is any good. This information is so powerful and wasn’t available to most of our parents in the same stage in their lives. Take advantage of all this free information on the web and use it! If you’re going to invest in the best steak knife set you can afford, you should probably know how to take care of them and how to store them. Let’s face it, for most of us, spending $100+ on something means we should value it and take good care of it. It’s kind of like the saying you hear parents tell their kids when the trash their toys or something. “This is why we can’t have nice things!” So, let’s make sure you know how to take care of, and protect, your investment. A common question after buying a good set of steak knives is how they should washed. Should you put them in the dishwasher? Even though some top rated steak knives say they are dishwasher safe, we recommend just washing and drying them by hand. This is especially true of the higher-end knives that tout high-carbon steel. It is more likely to rust or corrode than stainless steel. Do not leave these knives wet very long. Although stainless steel is corrosion-resistant, it can still corrode under the right conditions. Just be extra careful handling these sharp knives and always wash and try them from the back side of the blade so that you don’t cut yourself. Steak knives see more usage than most other knives in your kitchen and they require more care than standard flat ware. Protect your investment and take care of them. There are two really good reasons to carefully consider how and where you store your new steak knives. Both suggest you don’t just through them in a drawer like you would your normal silverware. First and foremost is safety. I can’t stress this enough, always keep sharp knives out of the reach of children! The other reason for a good steak knife holder is to keep the blades from prematurely becoming dull. When the edges constantly rub up against each other and more importantly hard surfaces, they dull rapidly. In some rare cases, steak knife sets come in a knife block and that works fine. More commonly, there are some steak knives that include a nice storage box that is made for exactly this purpose. You can also buy empty storage boxes for steak knives as well. There seem to be fewer steak knives with wooden handles than there were even just 5-10 years ago. Maybe it’s like clothing trends and they’ll come back in style again in a few years, who knows. Either way, steak knives with wooden handles require special care. Don’t get me wrong, they look very masculine and fit the motif of Western steakhouses all over America well, but they do require some extra work. Wood can rot, crack, warp, and splinter if not protected correctly. The main concern is water. Definitely DO NOT soak wooden handle knives in water. Try to hand wash the blade and keep the handle as dry as possible. Another big no-no is to put them in the dishwasher for the same reason. Like we mentioned above, we always recommend washing all your steak knives by hand. But, we are often asked about the best dishwasher safe steak knives and understand that not all of our readers are interested in washing by hand. You get busy and just want to through a lower-cost knife in the dishwasher and do something else. We get it! If this is what you’re looking for, we recommend the J.A. Henckels International 8-pc Stainless Steel Serrated Steak Knife Set. The reasons 2-fold. First, it’s an all stainless steel knife, meaning good resistance to rust and no rivets or other fasteners for incidental water collection. And maybe first and foremost, it’s an inexpensive set of steak knives that are also dishwasher safe. The reason we say this is because washing steak knives in the dishwasher is going to shorten their useful life, that’s just a fact. So, plan now to replace them sooner than you would if you buy good, high end steak knives from our list above and wash them by hand. Who cares about investing in a good set of steak knives anyway? We do of course! Some people don’t, and that’s fine. But, since you’re here reading this, we’ll assume you do. But why? There are lots of good reasons to care. We enjoy having nice things in our kitchen for many different reasons. Here are a few of the more common reasons we could think of. Let us know if you can think of others. It’s just easier to eat your dinner when you have a good steak knife. You spend less time fighting with your food and more time enjoying it. It’s more pleasant when you can just get through dinner without the hassle and annoyance of not being able to cut the meat quickly and effortlessly. Besides, it’s fun to have nice things! You work hard…you earned it. To some, having good steak knives can be a status symbol. You can impress your friends and family when they come over and have dinner with your “fancy” steak knives. They are a great conversation starter and everyone can appreciate the craftsmanship of a quality steak knife set. It’s not all about making cousin Eddie jealous either. When you spend the time making an awesome steak on the grill or sit down to a fine dinner, it’s nice to have tools that match ambiance. It’s a good way to take a sense of price in your cooking abilities, not matter what level they’re at. One of the best reasons to consider buying top rated steak knives is as a gift, especially for weddings and/or wedding showers. Every new couple needs set of good steak knives that will last for many many years. If you buy a quality set made with premium materials, knives can last a lifetime and be passed on through generations. We consider them “heirloom gifts”. Wait a minute. How does spending more money on knives, save money? No, it’s true. Hear us out! How many times have you paid $20-$30 for a set of cheap steak knives, only to find out the handles break or the blade bends a couple months later? We’ve heard numerous stories of folks who have bought so many cheap steak knives that they could have bought a good set of Wüsthof classics with the same amount of money. But instead, they have nothing to show for it except for some broken knives. Steak knives are an investment! Steak knives don’t work only on steak. They are a great tool in the kitchen for other meats as well. That includes chicken, roast, pork chops, and all kinds of other meats. If you get a set of good, durable steak knives, there’s no reason not to use them and enjoy them all the time. Don’t convince yourself that they’re like the fine china and can only be used on special occasions. Most of the best steak knife sets have lifetime warranties. If something happens to them, you can get them replaced. Did you know you can get our #1 top rated steak knives personalized? This is the perfect addition to a very special gift. Personalization is included initials forever etched in these great high end steak knives. See the images below for an example of what the engraving looks like on the Wüsthof Classic. You can add initials for even symbols. Personalized steak knives are the perfect gift for dad on Father’s Day. They could also be given for graduation or as a wedding shower gift also. We hope you enjoyed reading through the BladeAdvisor’s best steak knife reviews. Most importantly, we are optimistic that you learned a thing or two about steak knives. You should now have the confidence to go out and buy a good set of steak knives, whether one from the list above, or another that better fits your needs, whatever they may be. As a quick recap, steak knives come in many different levels of quality, and also fit into different budgets. We break these down into 3 categories: high-end (luxury), mid-range, and inexpensive. Only you can determine what budget is right for you. As we said above, our recommendation is to buy a good set at the outset so you don’t buy multiple cheap steak knife sets throughout your lifetime and still have nothing to show for it. Our other recommendation is to buy a set with a few more steak knives than you think you currently need. In the future you might need more and you don’t want to have to buy an entire new set to get a couple more. 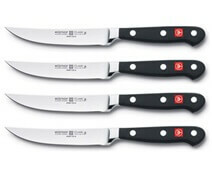 The BladeAdvisor team chose the Wüsthof Classic Steak Knives based on the criteria outlined in the buying guide above. Wüsthof is a family-run business that has been making quality knives for over 200 years. Here’s a short video about the brand. Thank you for taking the time to read through our recommendations and buying guide on the top steak knives. We appreciate your time and feedback. If you still have questions on something covered, or feel like we missed something all together, please feel free to contact as us the link below. Thanks!